If you – like many car fans around the world – were following the 2019 Geneva Motor Show (7 Mar 2019 – 17 Mar 2019), it is likely that you will have seen the revealing of Toyota’s first additions to the new Corolla range - the new Corolla GR Sport and Corolla Trek. In our special feature, we are delighted to bring you all you need to know about these exciting new models! Corolla GR Sport release date UK | The Corolla GR Sport is due to for European release in January 2020 – we are eagerly awaiting details of UK availability and specifications and will keep you posted in due course! The Corolla GR Sport is filled with spirit of Toyota Gazoo Racing, focusing on the development of the model’s dynamic looks and enhancing its driving capabilities. It will be the second model to join the European GR Sport line-up following the introduction of the Yaris GR Sport in 2018. Hatchback and Touring Sports variants of the Corolla GR Sport be available, in 1.8 or 2.0-litre self-charging hybrid. 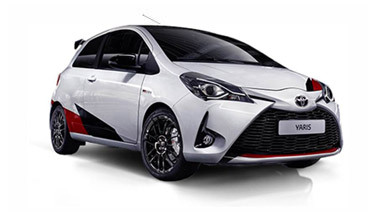 The Toyota Gazoo Racing influence is clearly seen with the Corolla GR Sport featuring distinctive styling elements, including lower skirts and sills, a rear diffuser and a new front grille with a sleek dark chrome finish. The GR Sport also has smart 18-inch machined-finish alloy wheels, rear privacy glass, front fog lights, LED headlights and an exclusive Dynamic Grey bi-tone paint finish. Inside the cabin, sports seats in black cloth upholstery are flanked by leather-effect bolsters. In addition, black and red stitching adds stunning contrast to the instrument panel, steering wheel and shift lever. The Corolla Trek Touring Sports is a more rugged, crossover-styled estate vehicle, designed to appeal to any of you who love outdoor pursuits. The Corolla Trek has also inspired a new collaboration between Toyota and Trek Bicycle, two brands that share similar environmental values and offer complementary mobility solutions. Founded in 1976, Trek Bicycle is one of the world’s most popular cycle brands, selling around 1.5 million bikes a year. Toyota has signed an agreement with Trek to provide Corolla Trek as support vehicles for the men’s and women’s teams competing in European events in the Trek-owned Trek-Segafredo World Tour. The Corolla Trek will be available with 1.8 or 2.0-litre self-charging hybrid powertrains and boasts a 20mm increase in ride height over the standard Corolla Touring Sports. It features front and rear underruns, 17-inch machined alloy wheels, front fog lights, rear privacy glass and LED headlights. Inside the vehicle, there is a seven-inch TFT infotainment screen, two-tone cloth upholstery and matching wood trim detailing. Watch this space for more information on the Corolla Trek Touring Sports crossover estate and the sporty Corolla GR Sport. Alternatively, contact one of the Farmer & Carlisle Toyota Fleet team on 0116 285 2851 to express your interest and discuss your requirements.